Nagpur: Maiden solo Bharatanatyam performance by Palaq Anup Agrawal, student of Bharatanatyam maestros Dr Kishoree and Kishore Hampiholi, enthralled classical music lovers of city on Sunday. 14-year-old Palaq demonstrated proficient excellence in Bharatnatyam and received applauds from the audience at Pt Vasantrao Deshpande Hall. Arangetram which literally means to rise to the performance space, is the debut of the Bharatanatyam dancer when she steps on to the stage for a first solo performance. As per the traditions and customs of BharatnatyamArangetram, Palaq started with ‘Thodaya Mangalam’ a prayer to almighty choreographed by Padmashree Adyar Shri K Lakshman. Here, she presented dance on series of Ragas (Raga Malika) and rhythms (Taal Malika). Followed by this, Palaq performed ‘Jathiswaram’ in Ragam Kalyani based in Roopak Tala. She went on to perform ‘Shabdam’ in Mishra ChapuTalam. She selected composition by Thanjavur Arunachalam Pillai for this section. In Varnam part of Arangetram, Palaq presented Smt Rukmini Devi Arundale’s composition in Ananda BhairaviRaaga. In Kirtanam section, she presented a dance composition by her Guru Dr KishoreeHampiholi. This was in Revathi Ragaam and words were composed by none other than Swami Dayananda Saraswati. In Padam , she showed her excellence while presenting on a series of Ragaas while in Abhanga, she selected a composition of Sant Bhanudasa. In Thillana, which is another important part of the presentation, Palaq presented choreography by Padmashree Adyar Shri K Lakshaman. The performance was made memorable by the top class instrumental accompaniments from nationally acclaimed artists. Sanjay Sasidharan from Pune provided flute accompaniment while Vishnu Daas from Mumbai was on Violin. Master Ellappa alias Yashwant Hampiholi was on Mridangam. Natya Sangeet Kala Bharathi Shri K Hariprasad from Chennai provided vocal support while Dr Kishoree and Kishore Hampiholi themselves played Natuvangam for Palaq’s performance. Palaq’s costumes for the show were designed by Shanti Tailors from Chennai and her make-up was done by Lalji Shrivas. The event coordinator from Ultimate Group’s Suhab Rabbani, Creative Artist Harish Raut from Chintamani Arts, Ace photographer Umesh Varma, award winning lightmenMithun Mitra Sandeep Baraskar and videographer Santosh Visuals made this event a real treat for the spectators. Shubhangi Rayulu, Kamakshi Hampiholi and Drea Agrawal compered the event. Vote of thanks was given by Smt Preeti Agarwal. 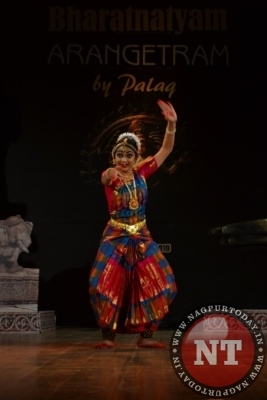 In all, it was a top-class performance of Bharatanatyam and many classical dance lovers appreciated it. Smt Ganga and Durgaprasad Agrawal, Vinita and Ajay Agrawal, Preeti and Anup Agrawal, Dr Archana and Dr Pankaj Dhawan, and entire team of A P Agrawal and Associates as well as Kishore Nritya Niketana have thanked art lovers who made this important event an unforgettable affair for Palaq and entire Agrawal family.